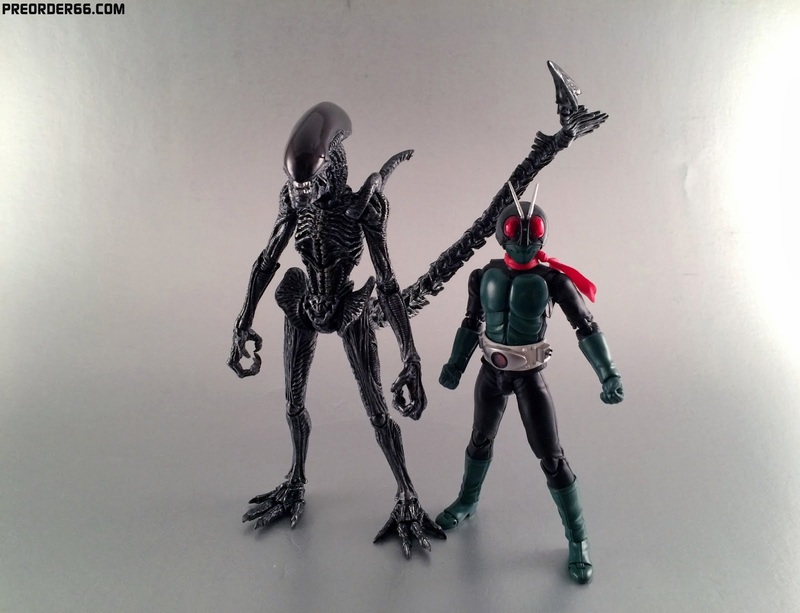 S.H.MonsterArts AvP Alien Warrior from Bluefin/Tamashii Nations! And here we are, two years after the inception of the MonsterArts label and we're getting not only awesome Godzilla figures, but ones from other franchises as well, Like Alien and Predator. This bugger here is the odd warrior design from Alien Vs Predator, the magnum opus of Paul W.S. Anderson. A glorious romp in a underground temple set in Antarctica and oh god I really hated this movie. But this isn't about that movie, it's about the Alien design from that movie. Meant to emulate the original 1979 Giger design, they went back to a jet black carapace and smooth dome head. Never mind the big monster feet. And they did a good job of representing that design here. With lots of organic and bio-mechanical details, they hit it with both a silver/grey and brown wash in a few places. The toy is all very shiny looking, giving it a wet feel, accurate to how the Xenomorph is portrayed in the films. This is a very thin, lanky version of the creature and the toy captures that well. Looking far more alien than "guy in suit", mainly due to it being a heavy CGI design I think the toy looks pretty good. Besides the neck. The skull done on the head is a very well done translucent brown, and in the light you can see the skull ridges underneath.In person it looks far more black than brown, this is one of those tricks of the camera. Speaking of the head, I really hate the neck on this toy. The articulation is fine, but this design has such a huge neck and I really hate that on the Xenomorph. It makes posing it a bit difficult, and does limit the side to side. The jaw is of course articulated, giving way to the trademark tongue mouth. My main issue here is the lack of friction on it. Once you open the jaw, it just slides out super super easily. Even when you'd rather have it in the mouth and not extended. This makes posing him with a open jaw more difficult than it should be. A bit of friction here would go a long way. The inner mouth is detailed fine enough, but the paint on the teeth made them a bit mushy. Same problem applies to the larger set of teeth. The torso is articulated at the chest and waist, both with pretty decent joints. The abdomen collapses into the chest so you don't get a big ugly gap when you move it, which is a nice touch. He can bend back pretty fair, and forward movement isn't as good, but far from being useless. The back tubes are all on ball-joints as well, so they can move around. Not super useful but neat. The neck ball joint can move forward and back, but more on that later. The elbow is a solid double joint, and the wrist is fantastic depending on the hand used. The shoulder is on a universal ball-disc. The upwards/outwards movement only goes so far due to the shoulder tubes, but you can swing it up and get a full 360 range of motion on it.the elbows both are on a swivel though so it makes up for the design-limited shoulders. He has articulated toes. Though they do not have a gigantic range it is neat. The hips and knees are amazing though, and the ankle is a tad limited, but I found I had little issues with it. The tail. I have mixed feelings about it. Not ever segment is articulated like a Kaiju tail, the first 10 are, then you have a chink of 3 down the rest of the tail until the fin which is broken into 3 parts, and then the spike. I wish it stayed together better. Mine was constantly coming out of various ball-joints, and the dicast tip of the tail made posing it harder than it should have been. I wish this wasn't the case but it is. Though the tail being difficult doesn't mean it totally hampers him. Quite the contrary it can help a pose out quite well, you just have to know how to pose it. Speaking of posing, this guy is fantastic. Getting him to any pose you want is pretty painless. And he can crouch and look forward which is pretty unheard of in the Alien toy world. For a movie monster that is known to crawl around and skulk in the shadows, most toy versions of the creature can't do that. But look at him go! Just creeping around on the ground like a animal. It's pretty awesome if you ask me. And really the toy does it without making it look like you broke the toy. This is a posture the movie creature could do, and being able to replicate that in a toy is unheard of. And he comes with accessories too. Besides the "fists" he has a set of splayed open hands, and a set of gripping looking hands, plus the egg and chest burster. The egg is well sculpted, but I think the pink is a bit too pink. They could have applied a nice thick gloss coat to make it look more wet, like the movies but for a solid hunk of plastic it isn't terrible. The rest of the color is ok, but this isn't a think to buy the set over, in my opinion. The Chest Burster is tiny, and doesn't stand up on its own. The detail is good, as is the silver paint on the teeth but I'm pretty "eh" on this accessory. The Stand can hold it up in a full airborne pose, so that is nice. the included arm and grip do a good job. The egg and Chest Burster are both a nice touch, but a face hugger would have been cool too. We're missing a key part of the Xenomorph life cycle, man! I'm sure we'll get one down the road honestly. Scale talk. The Xenomorph here at full height is a bit over 7 inches tall, and the tall is a bit over 8 inches long. Which Next to Ichigo here, he is roughly in scale. The movie versions are around 8 feet tall, so this makes sense to me. Him attacking any of your Figuarts guys just works, and likely Figma too. But a marvel legend will make him seem puny. Speaking of puny, next to SHM Wolf Predator, he looks anemic. Also short, as Xenos and Preds are supposed to be around the same height, with the Xenos being taller than the Preds. 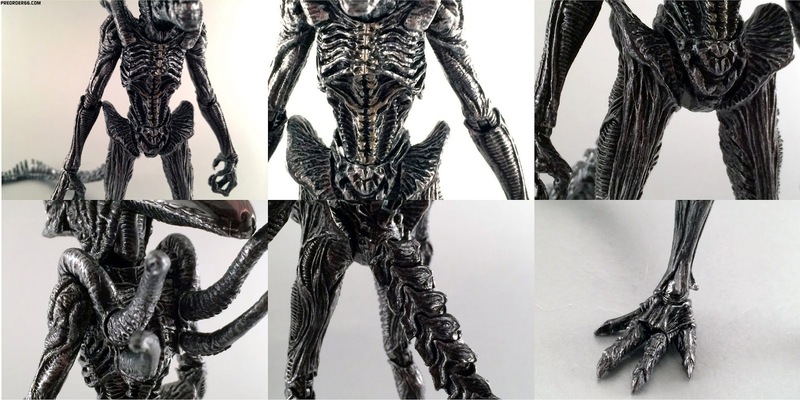 But with the Alien spending a lot of time crawling and crouching and leaping, this scale difference is unnoticeable. This is a thin spidery design, so the toy looks thin and spidery. I'm very curious to see how other movie Xenomorphs turn out. And in battle they both look about right, but once again the Alien does look a tad smaller than it should. The first Xenomorph attempt out the gate is from the one movie in the entire franchise I pretty much hate. That said this is a pretty solid toy. I had a lot of fun shooting this review, and this figure is fun to just mess around with. Plus it's their first attempt at thus type of monster, and I think they did a solid job. It makes me hopeful for the upcoming 1979 Alien design coming out. But with that one being based on a suit actor and this one based on CGI designs, I wonder if it will mean that one is less poseable. This one is super poseable and at a price of 48.99 it is a steal. This product was provided courtesy of Blufin/Tamashii Nations. No bugmen were harmed in the making of this review. Great review and great look at the figure. I impulse preordered from Amiami awhile back just because... well Aliens... and now that I have the Big Chap on Preorder I don't think I'm going to keep it. However if I do end up getting stuck with it and decide to open it at least I know I'll get a quality figure.